Family history and information on skarratt families. • crest Is it for real? Most of us at some time thought about our ancestors, some of us do try and find out more information about them, there are even some who spend some time researching there family history. If like me you found that a simple search for an ancestor entailed negotiating a maze of information from scattered sources, often ending up with little if any success, you will be interested in the following. I decided it was about time all known information world-wide was placed in one place. Little did I know what I had started, it seems that I became the catalyst for a major work of genealogy. The situation so far is that this website is to be set up for all Skarratt and soundex families. The aim is to bring all the related material together including family trees, historical and biographical info and make it accessible to any family member. Of course security of the info will be a priority, the info gathered will not be used in any way for financial gain either by the organisers or any other person, family or not. All material sources will be acknowledged and all copyrights cleared. If I do slip up please let me know. We already have a wealth of information on various sections of the family history. One man has given permission for all his collected family trees collected over 40 years research to be used. It mainly covers Autralia but also has some UK content.An American has American trees to include that she has gathered over many years. There are also people specialising in small areas, like a lady from Virginia, USA who has info to contribute. So if you have any information please contact us and help us amke this site the only dedicated family history required by anybody interested in the Skarratt family names. Beware of so called family sites which are inaccurate and solely there for financial gain. This site seeks no monetary gain and is solely to provide an honest and dedictated source for you. LATEST PROJECT : I have been putting together all the info I have on the families to produce a CD which I hope will be of use to the families involved. Thanks to the Local Records Offices & their staff for all the help they give me. I have been trying to find connections between the families in London. There seems to be a main settling of families in the East of London, St Pancras, Stepney and Finsbury. I have traced one family from London to Hereford and then to Australia with info provided. One problem is that the name Skarratt is often recorded as in the above family as Scarratt or Scarrott. These variations are endless and only by studying families their Churches and areas is it possible to achieve some links. We have four variations listed for the same family! No doubt the people involved new their name, but nobody seemed to understand them when they had to use it. There are of course many reasons that can be put forward for the variation, but this is only to illustrate the variations. My own GGF appears in the 1881 census as Skairatt ! No wonder I had trouble finding him. The LDS gives family groups and the streets they lived in, sometimes other families as neighbours. From the input I have received regarding site it may be necessary to split the site into sections for the various soundex name groups. Although there are One Name Sites, which everybody should refer to, there is still interest from individuals about there origins and some of them pass on points of interest which I feel should be included in this catch all site. Perhaps somebody out there has prepared pages that I could fit into site with info on their family name etc. More watches are coming to light, see below in watch section. Does anybody know where the Skarratt stone is in the Sheffield area? Latest info received indicating location, thanks to Adrian Skerrett.More info has arrived and I will add it to the Kington Site. I now have managed to get the Hereford Museum to find Henry Carleton Skarratt's "Gas clock". I have taken pictures of it, and also discussed with several people its method of working, which is not obvious from the state it is in at present. One family of Skarratts has the name Carleton running through it, and while researching them I have tried to find the reason for this inclusion. The first time I can trace the use of the name is for Carleton Skarratt, born in 1754, in London. One train of search is that it may have been his mother's maiden name, quite common in that era, but I have not so far found out her name to confirm this. But as with all genealogical research it has taken me on a long winding road. The living members of this family have told me that a family bible in their possession was originally handed down from a Carleton family member, a daughter supposedly. To add to my knowledge I contacted Lorna Carleton, whose book 'The Carleton Collection' is a definitive work on the Carleton family of Penrith etc. This has provided me with some interesting leads to follow, but also lead me to transfer her book on to CD for her , this makes it less costly to produce than short print runs. My research has led me to Croft Castle, Worcester, Hereford and other areas but I still have not confirmed a Carleton connection, so if you know of one let me know. Harrison, Croft, Carleton, Pemberton, Skarratt, there is a link somewhere out there somewhere. I have just found out that Carleton's mother was indeed Sarah CARLETON! >but as far as I can see there is no connection to the above family, its just a coincidence. I have drawn up the chart below to try and follow the trail but gaps remain. The following are notes on some of the churches that have connections with Skarratt families. The first reference is the building of what may have been only a shrine in 1090 by Alfune who was a friend of Rahere (See St Bartholomew the Great). The first reference to the church is a grant by Ã†lmund to the canons of St Paul's Cathedral of his church of St Giles, built outside the walls, in the time of Henry I (1100-35). The dedication is to a saint, born in Athens of royal parentage. Around 666 AD during a hunt, a hind took refuge from dogs in the cave where the saint was residing in solitude. The saint prayed and prevented the dogs from gaining access. The hind survived and provided the saint with sustenance, St Giles is the saint of maternity. The hind is a symbol of the saint and one is depicted over the door. 'St Giles of Cripplegate' was mentioned during the 13th century. The origin of Cripplegate is hotly debated; Harben considers that the most probable origin was from the Anglo-Saxon 'crepel', a burrow or 'crypele', a den and denoted the long underground narrow or covered way leading to the gate. Another view id that more cripple gathered at this particular gate than any of the other gates of the city. The first known church was built during the 14th century on ground outside the gate close to where the Walbrook ran under the London Wall. It was damaged by fire in 1545 and the London Chronicle has the following report: "The xil day of September, Satterday, in the mornyng, above five og the klocke, was Saynt Jyles's Churche burned, belles and alle, wtout Crepellgate." The church was rebuilt and Strype wrote that the church was "very fair and spacious." It survived the Great Fire and Joh Milton was buried in the churchyard in 1674. Between 1682 and 1684 the top of the tower was raised, and cased in brick by John Bridges. The parish of St Giles was a populous parish, and the Commissioners for the Fifty New Churches Act  proposed to build three churches within the parish. Ultimately only one new church was built - St Luke's, Old Street.. In 1791 the roof was raised and two additional bays added to the celerestory, in 1885 the south side was refaced and castellated. Restoration work was carried out in 1897 following a fire. In 1903 the north side was refaced and matching castellations erected. A bomb hit the building in August 1940 but it remained usable until a fire destroyed the church in the November. The church was fully restored by Godfrey Allen as the church of the Barbican development, it was reopened in 1960. Shakespeare attended the church in 1607 for the baptism of his nephew. In the last week of August 1665 there was 600 deaths due to the plague and records show over 8,000 people died in the parish. According to Stow "There was also a bosse of clear water in the wall of the churchyard, made at the charge of Richard Whittington, sometimes mayor, and was like to that of Billingsgate. Of late the same was turned into an evil pump, and so is clean decayed." This water source may have contributed to the high death rate in the parish during the plague. KEMSING, St Mary the Virgin. Located in Kent just north of Sevenoaks is the small village of Kemsing and its village church. East window: 3 lights. Christ in Majesty by Comper. 1902. Rev T.C. Skarratt in memory of his mother. Sanctuary North Wall: 2 lights in frame inserted 1891. The visitation, by Comper about 1902. In memory of Elizabeth hall. West window: 2 lights. The Annunciation, by Comper. 1911. In memory of Rev T.C. Skarratt from his sisters. North Aisle: 2 lights. ss. Thomas & Richard, by Comper. 1911. in memory of Rev. T.C. Skarratt, from his friends. Alice Ann Ward, nee Skarratt 1862-1904 and .....Elizabeth Sarah Skarratt nee Stephens 1824-1885. St Mary The Virgin, Kington, Herefordshire. The validity of this crest has come into question regarding use by certain Skarratt families. 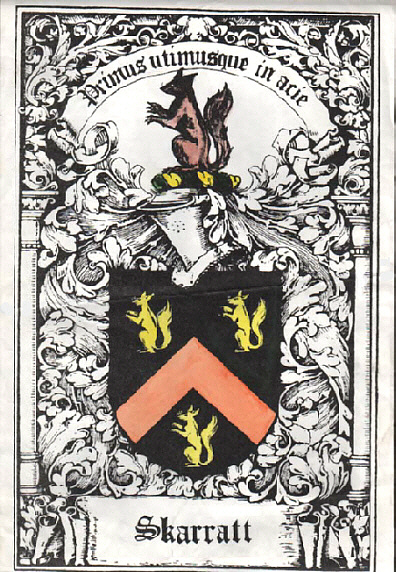 The similar coat of arms showing two squirrels was adopted by Skarratt family of Thomas Carleton Skarratt. The coat of arms can be found in Kemsing church, attributed to Thomas Carleton Skarratt but he did this to be accepted as gentry. Instead of applying to the College of Heralds they proceeded to make one for themselves. The nearest they could discover for a Skarratt was an Irish family of Skarreth (Skerrett) from Finvara, Co. Clare. Legitimate Skarreth shield is green field on which were a gold chevron and three gold squirrels. T.C.S modified it to two squirrels! Skereth (co.Galway; Reg. Ulster's Office). Vert a chev. betw. three squirrels sejant cracking nuts or. Crest-A squirrel cracking nuts. or. Another coat--Ar. three squirrels pass. in pale gu. Crest A squirrel cracking a nut gu. Skerett (co. Devon) Or a chief indented sa. Skerit (Petertavy, Tavistock, and Buckland Monachorum, co. Devon; Edward Skerit, of Petertavy, Visit. Devon, 1620, son of John Skerit, of Tavistock, and grandson of Thomas Skerit, of Buckland). Or a chief indented sa. 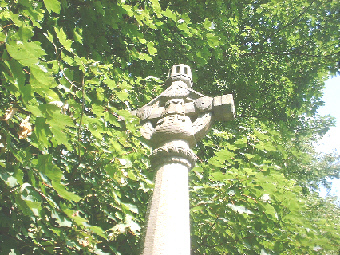 Alber Scarratt Hadfield War Memorial, Location: Station Road and Railway Street, Hadfield, Derbyshire. IN GRATEFUL MEMORY OF THOSE WHO GAVE THEIR LIVES FOR KING AND COUNTRY IN THE GREAT WORLD WAR 1939 - 1945 . William C. Scarratt " . During World War II the plane piloted by M.C.Skarratt was shot down and the crew killed. Below is a short account of the flight etc and comments from relatives and friends. The crew were from the 460 (RAAF) Squadron. The aircraft was AVRO Lancaster B.III. Codes were PB 255 AR-X and the base was at Binbrook, Lincolnshire. Details of the crash supplied was that the aircraft was underway to its target in Germany when it was intercepted by German fighters or nightfighters above the province of North-Limburg, the aircraft was badly damaged so the pilot decided to turn back to his base in England. Sadly above Oostelbeers the aircraft exploded and crashed in the woods. The crew were all KIA on 24/12/44 and are buried in Oostelbeers Roman Catholic Churchyard, Netherlands. Oostelbeers in a small village 13 kilometres north west of Eindhaven. Sgt. Thomas Charles Newman RAF (VR) The only English member. Of 11 crews that went out that night they were the only ones that did not return. "G" for George at the Museum in Canberra. â€œMy uncle's name was Robert Dickie and he was from Dunkeld, Victoria. The only son of 5 children. My parents live in Hamilton, Victoria which is about 3.5 hours drive from Melbourne (where I reside) and 30km's from Dunkeld. She has a few photos tucked away. My cousins were in Holland earlier this year and visited the gravesite where my uncle and the rest of the crew are buried. I believe M.C. Skarratt was one of the crew and are buried .Also do you know how many medals MC Skarratt received?â€� Sue. We are unable to locate any relatives of the Deed family to complete his file. MY GRANDFATHER, WILLIAM SKARRATT . 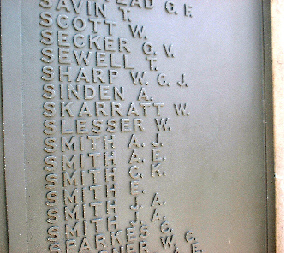 This is the tablet on the Naval War memorial in Chatham which has my Grandfather's name, Skarratt W. embossed on it. I never met my Grandfather and this was a very emotive moment for me to see his name on the memorial. If you lost family in the wars in naval service this is where there name will be. "Death of Honour"
see page on Kington Skarratts. This is the grave of Thomas Carlton Skarratt 1824 - 1900 in Kemsing Parish church, Kent. He emigrated to Australia in 1854 from Kington, Herefordshire. When he returned he was vicar at Kemsing until his death. I have assembled to trees that I have researched. None of the 'Sc' forms appears in Hanks & Hodges or in Reaney . (ii) 'a grower of white parsnips'. From Skirwith, formerly pronounced 'Skerritt'. Metonymic for a grower of parsnips. Skirwith as a Cumberland place-name is discussed by Gelling who suggests that it may be a hybrid containing an Old English first element (related to 'shire') plus the Old Norse second element 'vithr' (meaning 'wood'). I have no proof that the origin(s) of 'Sc' names is (are) different from those beginning with 'Sk', i.e. the two forms may in at least some cases be variants of the same surname: there is, for example, much evidence of spellings in parish registers and census returns switching from 'Sk' to 'Sc' and vice versa for the same person. However, this also does not preclude the possibility of further discrete etymologies for 'Sk' and/or for 'Sc' names - the predictable process of coalescence over time simply makes the problem of pinpointing etymologies that much more difficult. In the Oxfordshire (mostly Charlbury) parish registers, my own 19th century Scarrott forebears were generally spelt Scarriott, and their lines certainly ramified. However, although the Charlbury Scarriotts multiplied, the -iott spelling seems to have died out: the last Scarriot(t) occurrences recorded at the General Register Office (records began in 1837) are a male birth in 1902 and a female death in 1915. Although, across England, the -iott form is much less common than -ott or -att or -ett in the parish registers (as evidenced by IGI data), there are occurrences of -iott over a sufficiently wide area to suggest that -iott may once have constituted a discrete form. Furthermore, -iatt is apparently absent, i.e. the lack of an -att vs. -iatt 'contrastive pair' suggests that with -iott vs. -ott a distinction was perhaps deliberately being made to indicate two distinct names. There are other names ending in -iott or -yott, of which Marriott and variants (Merriott etc., leading to e.g. Merritt) are the most common. One of the most likely origins for 'Marriott' is apparently 'Mary' + a diminutive ending, '-iot' (Reaney p.299)). Could we therefore, on the same pattern, be looking for a first element + diminutive ending as a possible origin of Scarriott? Certainly, the name Scarr occurs, though, unlike Mary, not (as far as I have been able to ascertain) as a forename. (Reaneyp.412) has Sker, Skerr going back to Old Norse skarr 'bright', but for our purposes perhaps a bisyllabic form such as 'Scar(r)ey (whether as forename or surname) + diminutive' would be needed to match the 'Mary + diminutive' structure. If we knew that Scarriott spellings were documented sufficiently far back, it might be considering whether such a surname in some lines originated as a nickname. There is apparently evidence, incidentally, of many surnames of hypocoristic origin having once had negative connotations. It has been suggested that there may be a link between the names Scarriott and Iscariot, as in Judas Iscariot. Given that my early nineteenth century Scarriotts were illiterate and that the parish priests or clerks (who would be very at home with the name Iscariot) would have determined the spelling used in the parish register, there is a chance that they inserted, by analogy, an ostensibly missing 'i'. In 1998 I was in touch with someone called Schariot, a German speaker whose family was from Berlin. He was not sure of the origin of his surname but thought there might be a Huguenot link. Perhaps 'Schariot', since the first three letters are pronounced SH, not SK, at least in modern German, links in with 'Sharra' and 'Sarrat' and similar forms. John Scarrott, who at the time was Western Australia representative in the Romani Association of Australia, once told me he was sure that the etymology of his surname was explained by the extracts quoted below from Francis Hindes Groome: Gypsy Folk Tales, 1899. John Scarrott wrote: "I found a book by George Borrow [where it] was stated that 'They usually come this way, the Kay Scarrotts'. I wondered then - who are these Kay Scarrots? I found out in the end that they were the tribe. The Kay really meant Kalderie or Kalderash! It was a family that moved right round from Roumania through Europe and down into Africa. They were prospectors. They get the sheepskins and let the gold collect in that way. They come back through Spain... They went over the mountains into France and back into England. Each journey took about eight years... Caldarari means potmenders, Kaldrash copper smith.."
From introduction to Gypsy Folk-Tales:Francis Hindes Groome, 1899 ' halting-place. This conjecture, if valid, suggests the antiquity of these strange peregrinations; and Gypsies assuredly are the very staunchest conservatives. Another guess is that at Ascain Gypsies very likely are buried; that would fully account for their descendants turning aside thus..."
Cascarrot...may be a corruption of caraco. However, in the dictionaries of nineteenth-century argot one finds: cascaret (miserable) and cascara (skin, peel). The connexion is not impossible. In any case the Cascarrotes are attested in an interesting way in the Basque Country: "...between Bayonne and Saint-Jena-de-Luz one sometimes meets a troupe of young women going at a running pace and carrying baskets on their heads; they wear a silk kerchief round their heads, their necks are bare or have only a flowing neck-tie; compact of figure, they wear a red skirt raised the length of two hands, and their legs are bare; their eyes are black and their skin is bronzed. Who are they? Are these the daughters of some ancient or wandering race, Bohemians, Saracens or Moorish?" [Le Magasin Pittoresque, 1861] The author cannot give the answer. But the name itself leaves no doubt: it must refer to the Gitanes (and not to Gypsies in the sense of our differentiation, for these would not be bare-legged)." THE ANCIENT STATE OF THE TOWN, AND ITS CIVIL AND MILITARY HISTORY, TO THE PRESENT TIME. This old and respectable family is of considerable antiquity in Galway, the name was originally Huscared; and they derive their origin from a noble English family, one of whom, Roger Huscared, is mentioned by Dugdale, as a judge, at a very early period. Robert Huscared, or Scared, held lands in Connaught, under Richard de Burgo, in 1242. In the registry of the monastery of Athenry, Walter Huscared and Johanna his wife are mentioned amongst the principal benefactors of that foundation, and Richard Scared or Skeret, who is supposed to have been their son, was Provost of Galway in 1378. To him belonged the estate of Ardfry, in Mearuidhe, and other lands about Clare-yn-dowl, now Clare Galway to the friars minors; of which convent he bestowed a piece of ground, on which part of their monastery was built. Some of these lands are held by his descendants to this day. The principal branches of this name, at present, are those of Ballinduff,[] Carnacrow, Drumgriflin and Nutgrove in the County of Calway and Finvarra and Funchien in the County of Clare. Arms. Vert, a chevron, or, between two squirrels, counter sejant, in chief, and one in base, proper. Crest. A squirrel, sejant, proper. [] Motto. Primus ultimusque in acie. The Skerretts of ballinduff, Co. Galway, and Finvara, Co. Clare, have now died out in the male line--the last representative being Rev. Hyacinth Heffernan Skerrett, a priest. They were extensive landowners in both those counties eighty years ago. Some junior lines survive elsewhere, but the name is now very rare. It is included here because the family was one of the "Tribes of Galway". Of English origin it appears under the guise of Huscared, and subsequently Scared, as early as 1242, when they held lands in Connacht under Richard de Burgo. In 1378 we find the name as Scared, alias Scaret : in that year one of them was provost of Galway ; by 1414, when another of the name held that office, it had become Skeret. After that it occurs intermittently in the lists of mayors and sheriffs up to 1642, and they were listed as Irish Papists in the return made under the Act of Settlement of proprietors in 1640. Twelve years after that date, two Skerretts were among those townsmen who refused to sign the articles of capitulation at the end of the siege of Galway. Two of the "tribe" were Archbishops of Team : Nicholas Skerrett, who was expelled from the see in 1583, and Mark Skerrett, who held it from 1756 to 1775. REV. Hyacinth Hefferman Skerrett, of Finavara, Co. Clare, in Holy Orders of the Church of Rome, b. 2 NOV. 1845. 2 John, heir to his brother. 3 Hyacinth Hefferman (Rev), now of Finavara. 6 Charles Percival, B.A. Trin. Coll. Dublin, b. 30 Aug. 1852; m. 1884, Ada Mildred, youngest dau. of John Hansen Sperling, of Catton House, co. Norfolk, and d. leaving one son and two daughters. 7 Valentine Joseph, twins b. 9 Dec 1854. 10 Patrick de Basterot, Surge.-Capt. A.M.S., b. 20 Aug. 1861. 1 Helena, m. July 1864 Stephen Cowan, of Gornamona, Co Galway, J.P., late Capt Galway Militia. 3 Matilda, m. George Douglas Williams of London. 4 Elizabeth, m. Licut G H Yonge, R N.
John Patrick Skerrett, of Finavara, J.P., b. 30 Aug. 1844; d. unm. 1881, and was s. by his brother, esv. Hyacinth Hefferman Skerrett now of Finavara. No records exist for Galway prior to the date of the Anglo-Norman invasion. Athy is one of the earliest recorded names. Tribes of Galway an expression, first invented by Cromwell's forces, as a term of reproach against the natives of the town of Galway. This expression of the close bond of friendship and relationship between the chief families was adopted as a mark of distinction. These families were fourteen in number, i.e. Athy, Blake, Bodkin, Browne, Deane, D'Arcy, Ffont (or De Fuente), french,Joyes (or Joyce), Kirwan, Lynch, Martin, Morris and Skerrett. & Maclysaght's book of Irish Family Names. "From the earliest period, they were celebrated for commerce, and for many centuries were classed amongst the most considerable merchants of Europe. Their wealth was consequently great, and the ample landed properties, which they gradually acquired by purchase, from the native Irish, throughout the Province of Connaught, are now enjoyed by their numerous and opulent posterity. During the earlier periods of their career, they carefully avoided all connexion with their surrounding neighbours; in consequence of which, added to the circumstance of the town being so remotely situated from the more civilized parts of the kingdom, the inhabitants were necessarily obliged to intermarry amongst themselves, and in progress of time, their degrees of kindred so increased that they became, as it were, one family, and in many instances, it was a difficult matter to effect a marriage amongst them, without an ecclesiastical dispensation". Hardiman's narrative, however, requires both comment and qualification. It is true that intermarriage was very frequent, but the reasons behind it had as much to do with retaining property within the confines of the main families as it did with distance from 'civilization'. "the request made by Andraue Ffallon, on the behalf of his doughter, Julian Fallon, who is married to Donill Oge Ovolloghan of this same town, goldsmith, and for the better relieffe of the said Androwe Ffallon, who is old and impotente, it is condescendid and agreid by us, the said Mayor and Bailyvvis and combrethern of Galwy, aforsaid, that the said Donill Ovolloghan shalbe acceptid, taken and receivd in to our ffredoms, and lik as and acordingly oure previledges and chartors, had and obtaynid of suffraynis Kinges of ancient (times). And by vertu therof we, the said Mayor and Bayleffes, with oure combrethern, have gyvin and grauntid unto the said Donyll ffredome and ffre liberties in as ampull and lardg manner as we grauntid to anny other ffreman made by us and by thes presents we do gyve and graunt to the said Donyll his ffredome and ffredom and ffre liberties as well within this town, as also within and without the fraunchies and ffre liberties of the same". The distance Hardiman states the Tribes maintained from the native Irish was never as complete as his statement would imply. Although the creation of the Wardenship was a deliberate move to separate the ecclesiastical control of Galway from the Irish-staffed archdiocese of Tuam, in many other areas of life, the ruling families of the town mingled closely with their Irish neighbours and fellow townsfolk. In fact, as Seamus O Cathain pointed out in his excellent article Galway - 'An ancient colony of English' (Studies, 1940), "In spite of all the laws (discriminating against the non-English residents), the life of the town was too closely linked with the countryside, too dependent on it, to escape its influence. Not only did the town depend for its essential foods on traffic with the country, its trade was mainly a matter of exporting country produce - wool, hides, corn, and wood formed the bulk of the export trade - or of collecting that produce and preparing in the Galway workshops for export. As trade relations of this kind developed, we may be sure that the merchants saw to it that a good deal of this produce was paid for, not with money but with the commodities they were importing in ever increasing quantities - wine mainly, but iron also and salt, and...there was a very lively if underground trade in guns and other munitions". O Cathain points to an even more significant body of evidence strongly suggesting that the Tribes and their native Irish neighbours mixed more regularly than Hardiman implies - the use of the Irish language in the town. Although he observes that "Irish was never officially recognised" and "that the proceedings of the Corporation were conducted in English", from the general necessity of communicating with the tradesmen and 'unfree' townsmen, the Tribe families "probably knew at least enough Irish to carry on trade negotiations in that language." However, he argues that a strong case can be made for claiming that Irish was used more commonly and more naturally by the Tribe families than simply for business purposes. For example, there is the famous Ordinance of Henry VIII "enjoining the people of Galway to learn to speak English", which, taken together with the statement of historian John Lynch, in his Alithinologia (c. mid-17th century), "that the settlers differed in no way from the 'meer antient Irish' ", and "that they were as Irish as the old inhabitants, whose customs and language they adopted", certainly supports the contention that the Tribes used Irish in the course of daily life. O Cathain also draws attention to the fact - curious if Irish was not commonly spoken - "that many members of the great town families adopted Irish soubriquets such as Duff, Oge and Roe.. Many of them, too, used an Irish form of their names", and he concludes that this "is a very different matter from the use of occasional Irish words in the Corporation records". To the objection that these Irish soubriquets were "bestowed on them by the lower, Irish-speaking classes", he replies, "even if such were the case, why did they adopt them and use them in official business?" On the same lines, he notes the frequent Irish place-names found on the famous mid-17th century map, allegedly drawn for the Duke of Lorraine c.1650, such as "The lyon's tower, called Tor an Leoin"; one of the city gates "called in Sparra hier"; "Earl Street, or Sraid an Iarlagh"; "St. Mary's hill, called Cnucka in Tampeill Mirca"; "The whirlpool river, with the whirlpool, called Poultuofil", and "The salt lake, called Lough-an-Stale". "Admittedly", O Cathain notes," all these might have been simply the names given by the Irish-speaking classes, but why did the Corporation adopt them? Not for the Prince surely? What interest would a foreign prince have in such outlandish names. Could it not be argued that the members of the Corporation felt that the Irish names were the real names, the names in daily use, and that as such they should be included in the map?" Finally, in a note, O Cathain raises the perhaps obvious but generally neglected question, when did the Tribes learn to speak and write English? When they arrived in Connacht, they would have spoken Norman - French, and during the chaos of the 14th and early 15th centuries, Galway was virtually cut off from English influence. It is in this connection that Henry VIII's insistence that the people of Galway learn English finds its proper context. "That the inhabitants endeavour to speak English and use themselves after the English fashion, and specially that you do put forth your children to school to learn to speak English." The clear implication of this command is that the Old English inhabitants of Galway were not endeavouring to speak English, nor were they much troubled to "use themselves after the English fashion". Furthermore, that the citizens were not over concerned with their children learning "to speak English". Even if the king was not altogether accurately informed about the condition of the English language in the town, it does not make sense to command something to be done unless it is, in fact, not being done. Thus, so far from the English language being the lingua franca of the town of Galway in 1536, the evidence suggests that it was primarily used for official purposes, such as the records of the corporation and council meetings. We may imagine the Tribe families speaking a polyglot form of Norman-French - a kind of 'franglais' - with a certain proportion of 14th and 15th century English. Latin, we know, was also used for many official and ecclesiastical matters. Finally, there can be no doubt that the merchants of Galway spoke and probably wrote enough Irish to conduct their daily affairs and business dealings with the 'mere' Irish among whom they lived, traded, worshipped and, increasingly as time went on, married. The Galway Advertiser, 2/3 Church Lane, Galway. The founding families of Galway City were the mainly Norman followers of the de Burgos in the invasion of Connacht in the early thirteenth century. These settlers established themselves as merchants and, as the trade of the area grew, other families joined them - some of them also of Norman origin who had initially settled in other areas within County Galway. With the passage of time they sought to cast aside the suzerainty of the de Burgos whom they saw as allying themselves with the native Irish and adopting Irish customs. The walls of Galway were fortifications against military assault and a protection against Irish ways around an English enclave. The year 1484 was one of great achievement for these families because then they gained, in church and state affairs, a degree of independence which was unique. The vicissitudes of Elizabethan, Cromwellian and Williamite Wars did not weaken the will of those families to retain rights which originated in a fifteenth century charter or papal bull. It was in response to the Cromwellians that the former ruling families of Galway adopted the description 'Tribes'. On an elaborate seventeenth century map of the city the title was taken proudly, comparing the fourteen tribes of Galway with the seven tribes of ancient Rome. The families had already, in their pride and often without heraldic authority, adopted coats of arms which were ostentatiously blazoned on their stone houses. Since then it has been accepted generally that there were, in all, twice as many tribes in Galway as there were in ancient Rome and the names of those Tribes of Galway were laid down by the man who, in the reign of Charles II, had that map engraved, Rev. Henry Joyce, himself a member of one of the Tribes. Those Tribal families held tenaciously to their privileges and even as the nineteenth century opened they asserted their right to elect the Catholic clergy of the city of Galway. The creation of the diocese of Galway in 1831 in effect extinguished this last power of the Tribes of Galway. Other Galway Families Norman invasion. Their power passed to the O'Heynes. Nearby were the O'Shaughnessy and O'Cahill petty kingdoms. The Norman families who accompanied the de Burgos included not only the Galway Tribes but also the Berminghams who later took the title Lord Athenry. Many of the de Burgo descendants were to take names other than that of Burke which most adopted. For example the Jennings family is really a branch of the de Burgos. The form Jennings comes from the Irish Mac Seoinin, or son of John. They are descended from a John Burke. The Mac Redmonds are descended from Redmond Burke but most of them have dropped the Mac. It is sometimes thought that the Galway name MacHugo is a variant of MacHugh. It is, in fact, a separate family descended from Hugo Burke just as MacDavie indicates an ancestor named David Burke. The sale of Encumbered Estates after 1849 brought some new names such as Berridge into the area but they did not set deep roots. The older names have survived and are still strong in the territories of their ancestors. More detailed notes on a selection of the non-tribes of Galway follows. This article is reproduced from of Irish Roots Magazine in which it was published in Issue 1, 1994. In 1984 Galway celebrated its quincentennial - five hundred years of history (1484-1984). The event started a fashion. Since then we've had the Cork 800 the Limerick 300 and the Dublin Millenium. The original idea was the brain-child of Professor T. P. O'Neill of University College Galway. For the occasion he wrote a booklet entitled The Tribes and other Galway Families. I have culled from various sources a list of the watchmakers in the Skarratt family. Many of the books on this subject of clock & watchmakers, do not research the backgrounds of these people and therefore give a misleading picture of the actual numbers involved. I have tried to sort the facts given into a more accurate list, with my knowledge of the Skarratts in particular. Cecil Clutton, G.H.B. Btitten's Old Clocks and watches and their makers, 9th Edition. KAY'S of Worcester by Skarratts! I have been informed that Kay's of Worcester bought out a Skarratt clockmaker, at one time they had a heading "late of Skarratt" on their notepaper. Their early catalogues still had the name J.M.Skarratt on the title page. Kilburn Kay the founder of the Kay's mail order company, initially Kay worked for Skarratt's. He is noted in the 1881 census as a "jeweller's assistant" living over the shop at 3 Broad St. It would appear that by 1891, Kay had either bought out Skarratt or John Martin Skarratt had retired, he would be aged 57. Watches exist with the name "Kay, Jones & Co., Worcester" from the 1880's, so was Kay in direct competition, if it was Kilburn Kay. In the Kay's early catalogues there are clocks and watches with Kays name on that are identical those made by Skarratt, even to the marquetry on wall clocks. Skarratt made station clocks for the G.W.R. and it is suggested that Kay's bought Skarratt out to get the lucrative contract with the G.W.R. The Skarratt family moved from London about 1780 to Kington in Herefordshire. Carleton was a clockmaker in London, apprenticed according to Clockmakers' company in 1776. Because his brother Thomas was also apprenticed to Jane Saxby in St John St, London, he my have been apprenticed to her as well. Thomas b.1757 in London, was apprenticed in 16/3/1772 and completed it in 4/11/1782. He was in business in Kington in 1788 - 1796. His brother John b,. 1760, went to Worcester in 1792, after being apprenticed to Thomas Banfield, St John St, London. Unfortunately the brother he joined in Worcester, Charles Carleton, b.1761, went bankrupt in the same year. John later had a business in Goose Lane, Worcester in 1794. Carleton had one son and three daughters. His son Thomas Carleton, 1776 - 1838 was born in London. He continued the trade of clockmaker in Kington. He is listed in Pigots in 1830 as a clockmaker. Although Thomas had a large family of 10 children, only Henry Carleton, 1809 - 1888, followed him into clockmaking trade. He worked in Hay-on-Wye in 1835 , the shop is still a jewellers. He returned to Kington, probably when his father died and joined his mother at 45 High St in the business.. It was Henry who had a "gas" clock in the window of his shop. The dial was lit by a gas jet at night so people could see the time! It died down during the day and turned up at night. At present the clock is in the archives of Hereford museum, but, I have seen it and describe it more in the Kington pages. William (Peplow) junior was succeeded by his son, William, who was born in 1864, and began learning the skill of watch-making from the age of 10. He became best-known by his middle name of Henry and was sent to Worcester, in his youth, to gain experience with the then well-known gold and silversmiths, JM Skarratt of Broad Street. It was a firm nationally-known for making railway clocks. From this is Worcester News. Has anybody out there any Skarratt timepieces or knows the location of them? I would like to know about them please. As Bernard Mills and I have no records of watch production we hope to gather info to form some kind of record, neither I or Bernard are experts on watches but are interested in them through the Skarratt and Kay connections. I am glad to report that people are sending in info on pieces they have, so we may be able to list out some items soon. One longcase recently on sale had the initials A.M. Skarratt, of Worcester on the face. I can find no trace of any A.M.Skarratt, and it is almost certainly J.M.Skarratt. Obviously the person who restored it was not familiar with the Skarratts, and it begs the question, 'How does it effect the price'? Another watch I was informed off recently was a puzzle to me. It was engraved 'Skarratt & Co, Worcester, but made in Soluere. It appears this is an early example of badge engineering, the watch is Swiss made c1900 and marked in a similar way to Kay's marked up Skarratt watched etc. Here are questions raised by correspondents which you might be able to assist with. Books that I have found associated in some way with the families. The Diaries of Thomas Carleton Skarratt (1818-1909), Kington History Society. Irish Families: Their Names, Arms and Origins. by Edward Mac Lysaght. Burkes General Armorial & Relative info of England, Ireland & Wales. 1874 3rd Edition. I have used many sources to search out family members and continue to find new names and listings. I have concentrated on Skarratt, my family name, but have also added soundex names to a lesser degree for now. It might even be that my family name may have been be Scarratt or one of the other variations, this is always in the back of my mind when investigating new sources. Many people start with the LDS, and quite rightly. Whatever you think of their doctrines and the listing inaccuracies might be, it is still an important source of info for all researchers. We sometimes despair at its odd entries, but we have all used it and thank the LDS for their immense work. The only drawback and especially for me, is that certain parishes refused to give access to their records. Herefordshire for instance is very limited in its entries because of the refusals. In these case its parish record archives in local offices that are the next step. The public record office has lists of Births, Marriages and Deaths, from 1837 to 1999. Some libraries have these records on microfiche and they provide the full name, place of registration and year quarter of event. Later dates give age on death, maiden name of spouses. Some of the early ones are very difficult to read, to the point of indecipherable, even with a magnifying glass! Sometimes it is not clear which registration office is noted. For instance, Ashton is an office, bit their are several Ashton's around the country, and their is no indication on the record as to which it is. But, if you look at the rag No. i.e.6d 238. this can be referenced in the Register book which gives the location. Don't guess, 6d is used for Warwick, Preston, Ashton, Birmingham, so it could any one of the Ashtons.. I believe this to be my GGF (Maternal). His wife was Jane Palmer (from Naval records). The name is almost certainly Skarratt, I have never come across Skairatt before. My GF was born in 1881 & christened at St Pancras, and two more sisters, Sarah Ann and Rose were born later., christened at St Giles & St Pancras respectively. 1,PearlCrescent,Lower Road, Pentonville c 1839. Prob. active from c1791. Humphries and Smith. Database, Great Britain: Instrumental Works Based on Don Giovanni. Not including complete work or extracts for piano and voice. Dates and Publishersâ€™ plate numbers given according to library catalogues. Fruits and Flowers ... A series of amusing and interesting pieces ... for the pianiste. Pretty Flower do not fade, etc. & accompaniments by R. T. Skarratt. Below is a story which would appear to involve the above R.T.Skarratt. Prefaces to psalmody books often give a fascinating insight into the problems their compilers had to overcome to get their work into print. Owen Jones Williams shows a remarkable resilience, as the following transcription indicates. With a view of supplying the deficiency of Psalmody in Wales, the following Christmas he took his manuscript (containing a treatise on the elements of singing in connection with upward of 260 Psalm and Hymn Tunes with Anthems,) and delivered it to a Mus. Doc. near Bangor-Ferry, in order for him to employ an Engraver in London to engrave the same, while the Author followed his employment in his native Country: the Dr. refused to enter into an agreement, nor would he consent to accept any remuneration, but said he would assist him with the greatest pleasure. The prospectus was circulated, announcing his Work would be ready for sale in June 1816. March, 1816 the Dr. went to London ..., and took the Author's manuscript with him to Mr. Skarratt the Engraver, but when he understood that it was the first Work of the kind ever written in the Welsh Language, and consequently much more valuable than he at first imagined, he made an attempt to pass it on to the Public as his own Work, and claiming an equal share of its profit. November, 1816, the Author went to London to expedite his Work, and paid Mr. Skarratt Â£18 on account of his Plates, and the remainder to be paid when finished; but the Dr. refused to deliver the Work to its Author, unless he was allowed his half of the profit of the whole Work, afterwards he offered to accept Â£100, which the Author resisted, and after vain efforts to deliver his Work to the Subscribers, he was forced to submit to the oppression, and deprived of all his laborious production. In May 1818, the Dr. sent the Author a bill of Â£181 for his trouble, with a writ to arrest him for the payment of it; the cause was brought on at Guildhall, and referred to arbitration: Mr. Skarratt (who engraved the Work,) considers the law expenses and loss of sale of 2000 Copies would at the least amount to Â£700; to which must be added the 400 Copies which Mitchell kept, amounting in the whole to Â£1330; and to recover his losses, the Author has no resource but the sale of the present Work. I have received info from Michael Kassler in Australia about this item. It would seem that he was Richard Thomas Skarratt and his father Richard Skarratt. R.T. Skarratt was like his father a music engraver and succeeded his father in the business, he also composed music. The father lived at 16 Charlotte Street, St Pancras, London. He wrote his will on 14th Feb 1805 and administration was granted on 28 March 1821. He was married in 1780 to Susanna Ann Davies. Michael would like anyone with more info to let him know. I have progressed a bit further with Richard and his connections to the London families and his occupations. (see London website). Although based on the Skarratt name I have found the following variations. The reasons for the variations include misspellings, mispronunciations, accents misheard, illiteracy. I do not suggest that Skerrett and Skarratt have a common source but propose the following analogy. Skerrett of Galway, like many Irish families, including my own in-laws, may have crossed to Liverpool by boat. Liverpool has always been a home form home for Irish people in England. The name is common in the neighbouring areas of Manchester and the Wirral, in Manchester the name Skarratt is also to be found in numbers second only to London Skarratts Could they have been originally Skerretts?. http://freepages.genealogy.rootsweb.com/~tyeroots/index4.html List of counties & batch Nos. www.englishorigins.com Genealogy data site for family history research with S.O.G. http://searches2.rootsweb.com/cgi-bin/listsearch.pl 1891 surname project (mailing listarchives) "London1891"
No information on the living is displayed, only names and relationships. We do not make information on the living available unless they agree to it. I have where possible to obtain permission for material included and acknowledged source. If you find information included here which you feel I have not obtained permission please let me know at once. Please remember this is a family research project and as such no profit is involved, the information is provided free for family members on a research basis, no material included may be used for profit by other parties. If you use any of the information included in the web site please gain permission from those involved. All material is included in good faith. If for any reason material included causes offence in any way please contact me at once and it will be rectified.